A Brooklyn Photographer’s Wildflower Book . . . I began to seek out and study wildflowers during my grade school years. Solitary nature study always excited me more than team sports, perhaps because I always found myself more adept at reading books than at handling balls. During this time, the popular Golden Guide series provided a gateway to the taxonomy and identification of wild plants. I inherited several of these titles from my mother; guides that helped me to identify wildflowers on summer hikes up and down the undeveloped hillsides of my neighborhood; books that engaged my imagination during snowy winter hours. Most had been published during my mother’s childhood in the 1950s and featured a style of illustration that to this day brings out an emotional swell in me. The colors, often faded on the page, resonate with a beauty akin to the real thing pressed between the pages of book. Old field guides found in used book stores can create more excitement than the publication of a new, glossy title featuring stunning photography. The reason, to me, is the simplicity and greater sense of sincerity often found on the pages of antique guides. One such treasure find I have made is an edition published by Pocket Books in 1951: The Pocket Guide to the Wildflowers: How to Identify and Enjoy Them by Samuel Gottscho. 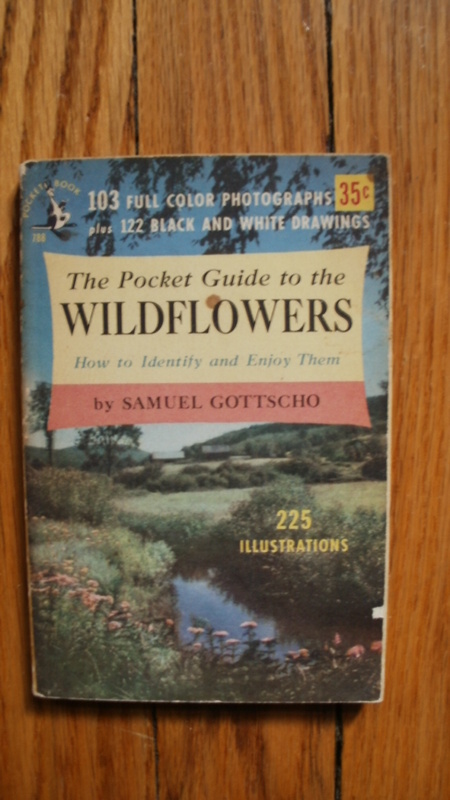 The author, Samuel H. Gottscho, is a wildflower authority with a unique connection to the Wildflowers of the West Village. He was a native New Yorker, born in Brooklyn in 1875, who died forty years ago this month on January 28, 1971. Gottscho’s story is an excellent example of how a career change made in mid-stream can begin a new journey that blooms into the greatest achievement of a lifetime. Gottscho’s passion was photography, which he began to pursue professionally only at age fifty after two decades in the fabric trade. He focused on house and garden imagery and eventually became a regular contributor to The New York Times and other publications. Gardens undoubtedly lead Gottscho further afield into the wild spaces of New York State. His adventures with the lens allowed him to compile an exemplary beginner’s guide to the wildflowers. He begins with basic information that includes the elusive “WHY” along with the standard “HOW” material. Subtitles such as “The Pursuit of a Hobby” and “With the Seasons” add subjective joy to the objective study. Added to this are set pieces that begin and end the book “Common Evening Primrose” and “Tiger Lily” that along with the included line drawings suggest Gottscho was as interested in the aesthetics and poetry of wildflowers as he was in their identification and organization. The book divides identification into four sections: Blue, Yellow, White, and Pink. Line drawings supplement the Latin names and brief descriptions. Gottscho’s photography is spotlighted by a series of color plates at the beginning of each section. His field of view is close up, finely framed, with an emphasis on the native surroundings in which a given species thrives. The result is living still life compositions, taken in situ; with a perspective trained by Gottscho’s love of the garden. The author and photographer enjoyed the fruits of his wildflower photography passion during his lifetime. He won a Distinguished Service Medal from the New York Botanical Garden in 1967 (which I find ironic, that being the year of my own birth). His work was exhibited posthumously in a 2005 retrospective – “The Mythic City: Photographs of New York” – at The Museum of the City of New York. Today his photos can be viewed at the Library of Congress and in two places in New York City: the Avery Architectural and Fine Arts Library at Columbia University and the Museum of the City of New York. 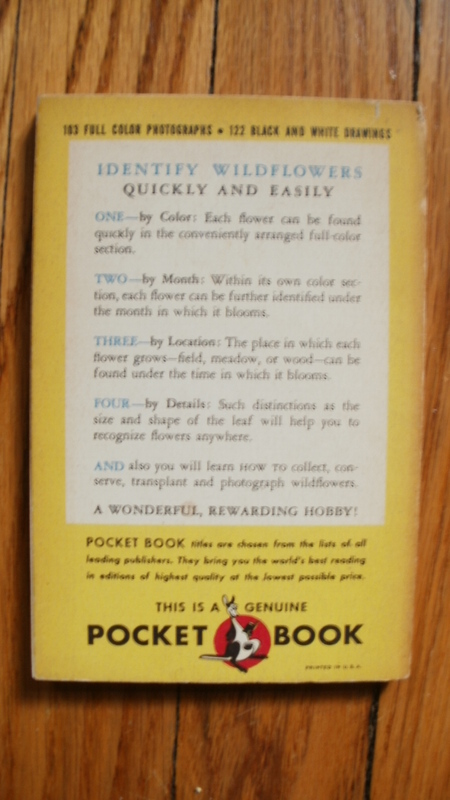 Gottscho, Samuel, The Pocket Guide to the Wildflowers, Pocket Books, Inc., New York, NY, 1951.